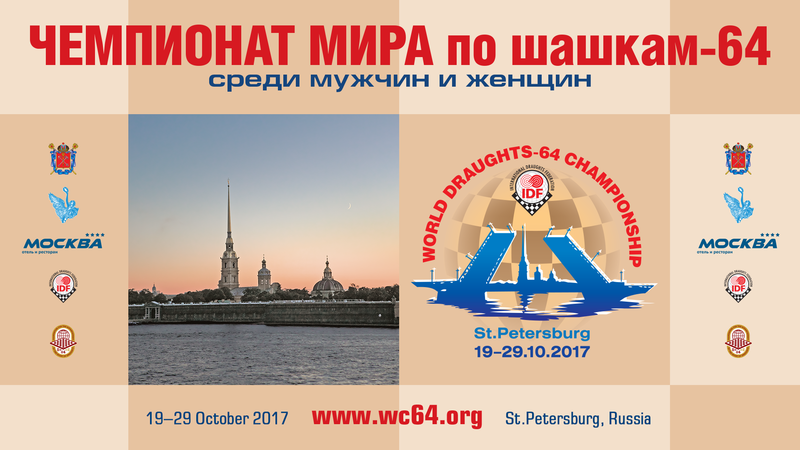 World Draughts-64 Championship 2017 among men and women is held with the support of the Foundation for Promoting the Development of Draughts Sports “Russian Draughts” from 19th October (arrival day) till 29th October (departure day) 2017 in St. Petersburg (Russia) at the hotel “Moscow ****”. Competitions are held separately for men and women in three program: Blitz, Rapid and Classic. 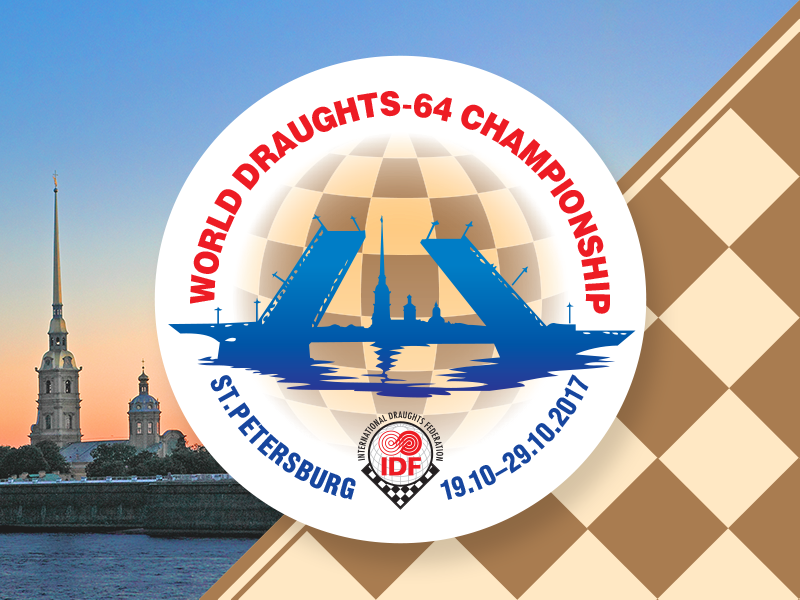 Blitz and Classic program are held in International/Russian version of draughts-64. 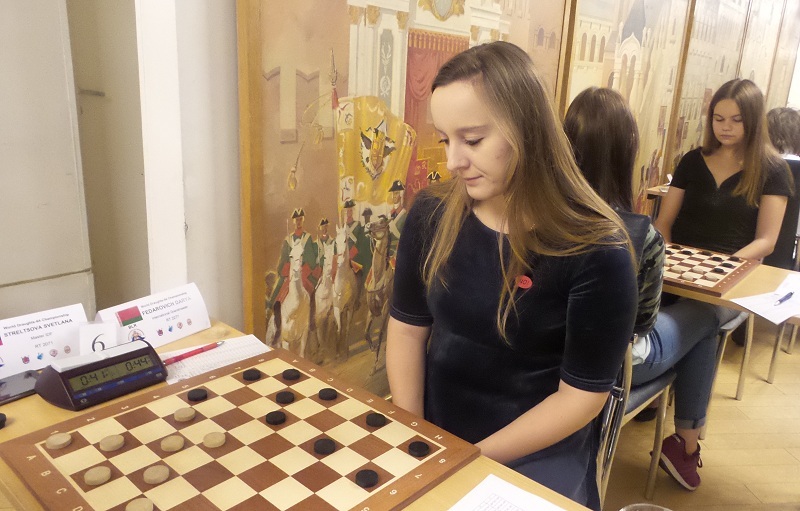 In Blitz, international grandmasters Gavril Kolesov (Russia) won in men and Elena Scovitina (Moldova) won in women. 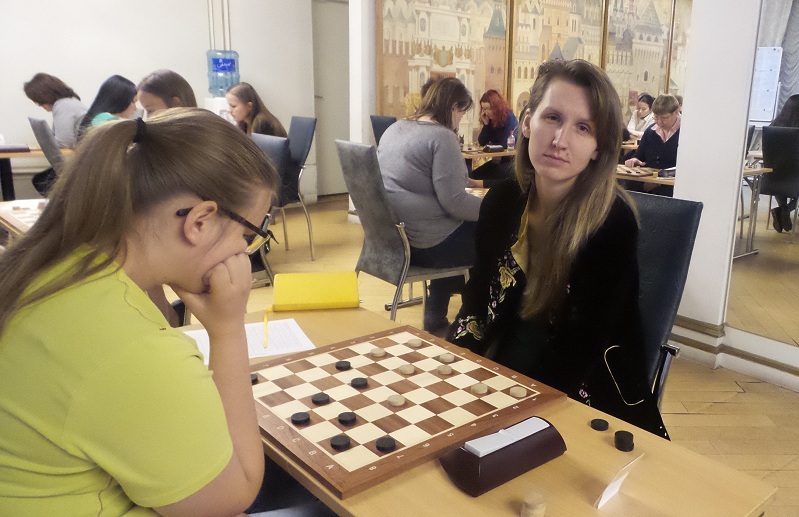 In Rapid, international grandmasters Ihar Mikhalchenka (Belarus) won in men and Elena Scovitina (Moldova) won in women. Ihar Mikhalchenka (Belarus) and Zhanna Sarshaeva became a world champions in classic program. 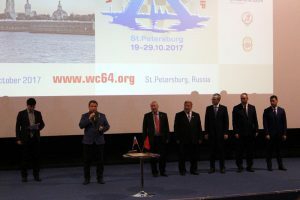 28-10-2017 Closing ceremony of the World Draughts-64 Championship among men and women took place at 6 pm in the big cinema hall of the hotel “Moscow”. See photo from closing ceremony. 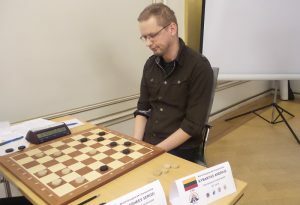 The president of the International Draughts Federation Vladimir Langin, presented the newly-produced signs “International Grandmaster” and “International Master” to the participants, who were awarded these titles since the IDF was created, and also he awarded diplomas players who were awarded IDF titles. 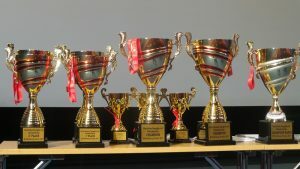 Prize-winners of Blitz, Rapid and Classic programs among men and women were awarded with cups, medals and diplomas. All participants of the competitions were awarded with memorable diplomas and a branded toy with IDF logos and logos of the Fund “Russian Draughts”. 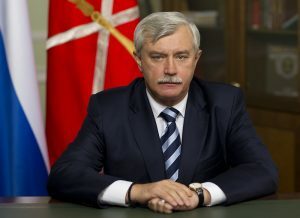 The prize fund of the championship was 3 000 000 rubles (about 52 000 US dollars). 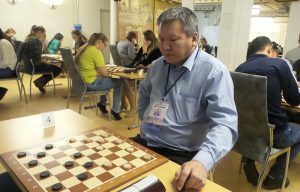 28-10-2017 Igor Mikhalchenko won the second micromatch in the final game for 1 place with Andrius Kybartas and won the title of world champion 2017 among men !!! Zhanna Sarshaeva won the second micromatch in the final game for 1 place with Elena Scovitina and won the title of world champion 2017 among women!!! 27-10-2017 In the 1/2 final of men competition Ihar Mikhalchenka won Vladimir Egorov and Andrius Kybartas won Arunas Norvaishas. Tomorrow in the finals for 1 place will play Kybartas – Mikhalchenko and in the finals for 3 place will play Egorov – Norvaishas. In the 1/2 final of women competition Zhanna Sarshaeva won Iuliia Makarenkova and Elena Scovitina won Darya Fedarovich. Tomorrow in the finals for 1st place will play Sarshaeva – Scovitina and in the finals for 3rd place will play Fedarovich – Makarenkova. 26-10-2017 The players who won their matches in the 1/4 finals in who will play in the 1/2 final were Vladimir Egorov, Igor Mikhalchenko, Andrius Kybartas and Arunas Norvaishas. Tomorrow in the 1/2 finals for 1-4 places will play pairs: Egorov – Mikhalchenko; Kybartas – Norvaishas. Women who won their matches in the 1/4 finals in who will play in the 1/2 final were Zhanna Sarshaeva, Elena Scovitina, Darya Fedarovich, Iuliia Makarenkova. Tomorrow will play pairs: Sarshaeva – Makarenkova; Scovitina – Fedarovich. See the results of the 1/4 finals and 9 rounds, the draw for the semi-finals and the 10th round for men and for women. 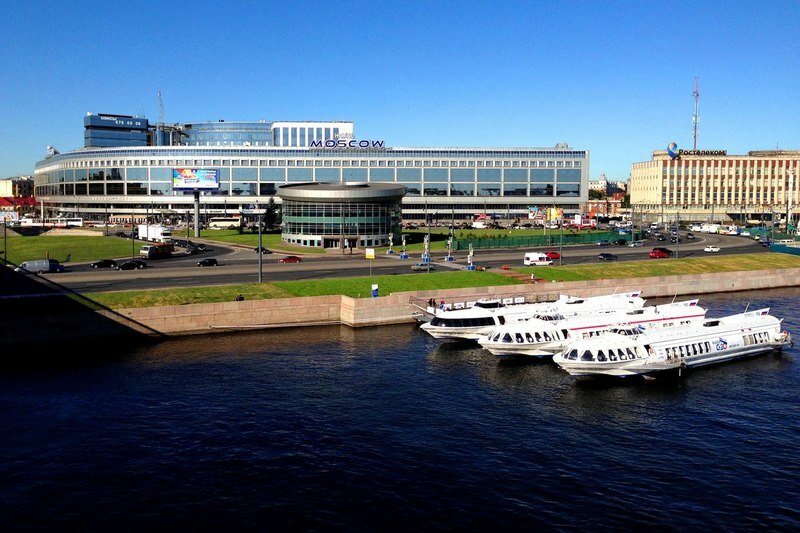 At 16.00 the participants of the World Championship went on bus tour around St. Petersburg. 25-10-2017 The draws for the 1/4 finals and 9 rounds for the players ranked 17th and below are published. 25-10-2017 The preliminary stage of the classic program is completed. See the results. In men, 10 players scored 11 points and only 8 of them got to the first 8, which will play medals in the classic program of championship. 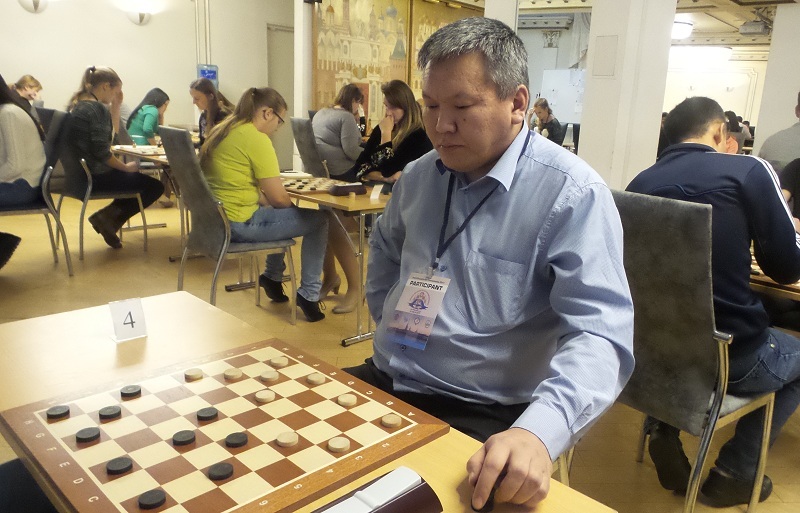 International grandmasters Sergei Belosheev and Nikolai Gulyaev have the lowest coefficient and will fight for 9-16 places. In women, 3 players scored 11 points and 6 players scored 10 points each. Vera Khvaschinskaya (Belarus) was not included in the first 8 players by the coefficient. She will fight in the second group for 9-16 places. 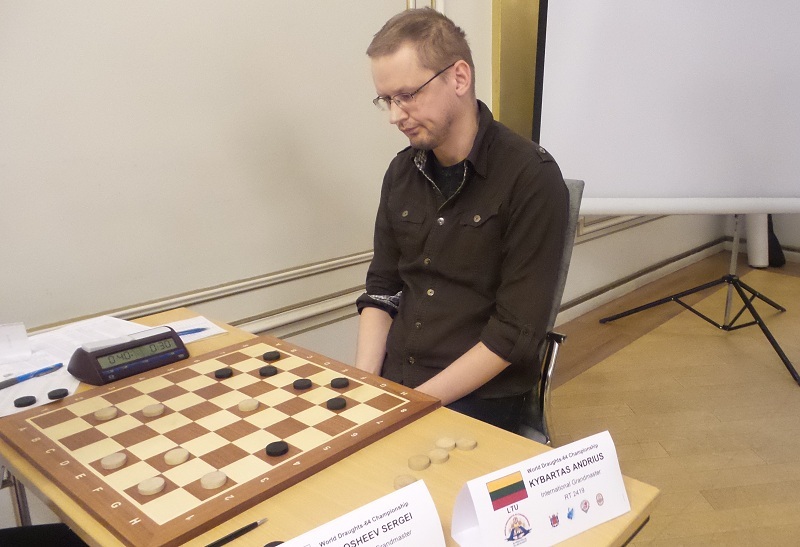 24-10-2017 After six rounds of the preliminary stage, to the leaders of the fifth round Andrius Kybartas (Lithuania) and Damir Rysaev (Russia) were added the talented 20-year-old player Domantas Norkus (Lithuania), who scored a sensational victory over the world champion Andrei Valyuk (Belarus) and Asian champion Mirat Zhekeev (Kazakhstan), who won the strong 80-year-old international master Dmitry Lond from St. Petersburg. They have 9 points from 12. Darya Fedarovich (Belarus) with a score of 9 points from 12 still leads in the women. Iuliia Makarenkova (Ukraine), Zhanna Sarshaeva (Russia), Niara Abdishaeva (Uzbekistan), who in the fifth round scored an important victory over Anastasia Baryshava (Belarus) and Elena Korotkaya (Ukraine) have one point less. 24-10-2017 The Press section is regularly updated on the site www.wc64.org. The section publishes articles on the championship in the press and on television. 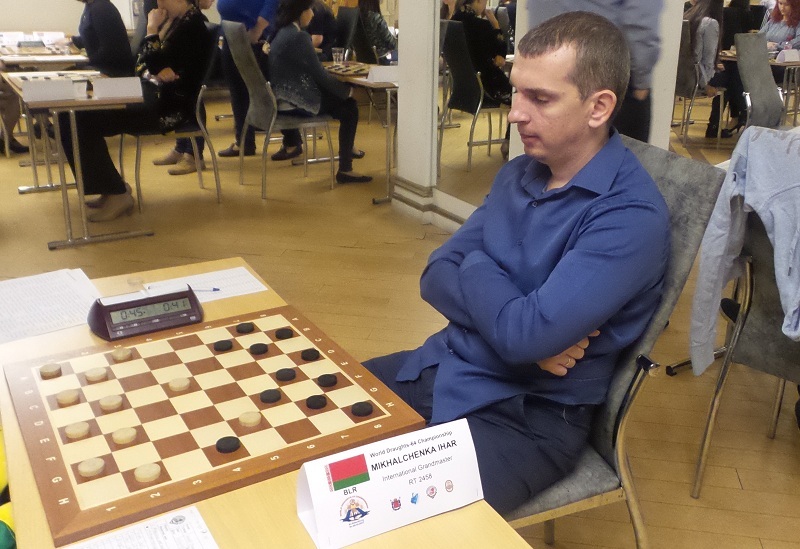 24-10-2017 After five rounds of the preliminary stage, international grandmaster Andrius Kybartas (Lithuania) and international master Damir Rysaev (Russia) are leading in men with the result of 8 points from 10. 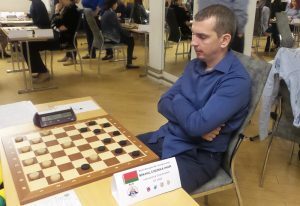 This is a sensation of the fifth round that Damir Rysaev beat four times world champion Nikolai Struchkov and became the leader of the championship. For women with a score of 8 points from 10, Darya Fedarovich (Belarus) is in the lead alone. Zhanna Sarshaeva (Russia), Iuliia Makarenkova and Elena Korotkaia (both Ukraine) have one point less. 22-10-2017 Classic program of the World Draughts-64 Championship among men and women started. 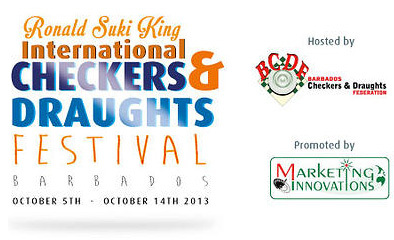 Competitions for men and for women will be held in 2 stages. The preliminary stage is held by the Swiss system in 8 rounds. Then the first 16 people are divided into two two groups with 8 players and play play-offs in ¼ finals, semi-finals, finals. In the play-offs, the game goes to the victory without taking into account the previously accumulated points. In the case of a draw, additional matches are played. 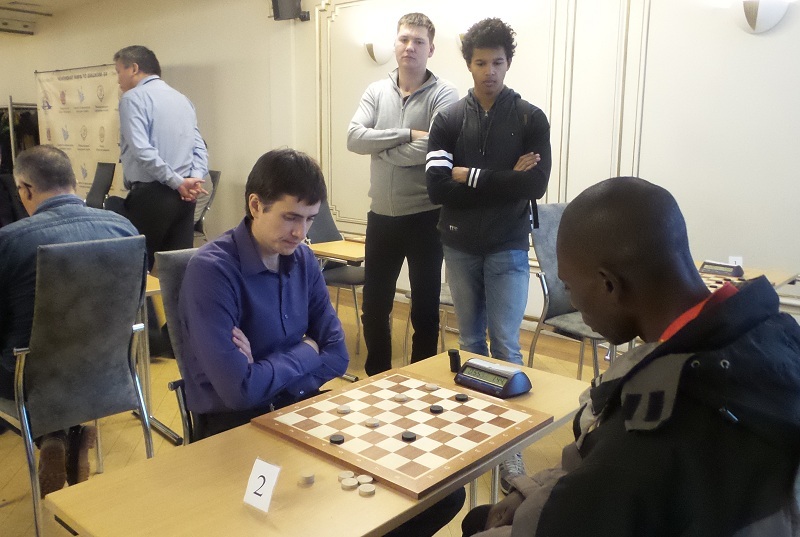 Participants, who took 17th place and lower, play additional two rounds by the Swiss system. The system of holding is described in detail in the Regulations of the World Championship 2017. 21-10-2017 Rapid was held today. 71 men and 31 women from 43 countries took part in the competitions. See results. 20-10-2017 The World Draughts-64 Championship among men and women is held with the support of the Foundation “Russian Draughts”. 20-10-2017 Blitz was held today. 74 men and 34 women from 43 countries took part in the competitions. Among them there were 22 male and 6 female strongest grandmasters of the world. Alexander Perelman and Vladimir Langin made traditional first moves, which gave the start to the World Championships in St. Petersburg. 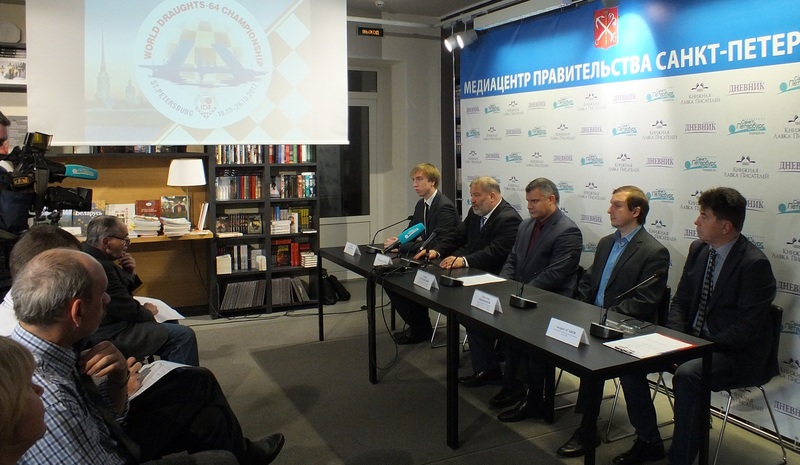 18-10-2017 A press conference, dedicated to the upcoming World Draughts-64 Championship was held today at the Media Center of the Government of St. Petersburg (Nevsky Prospect, 66). Adviser to the Chairman of the Committee for Physical Culture and Sport of St. Petersburg Roman Shumansky; President of the International Draughts Federation (IDF), President of the Draughts Federation of St. Petersburg Vladimir Langin; Vice-President of the International Draughts Federation (IDF) Andrey Agapov; Tournament Director of the International Draughts Federation (IDF), Director of the School for Chess and Draughts Alexander Nikiforov and St. Petersburg Grandmaster of Russia, silver medalist of the World Team Championship 2017 Dmitry Melnikov participated in the press conference. 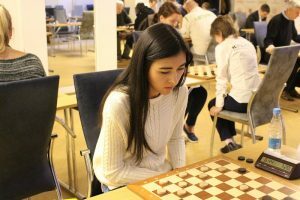 17-10-2017 Preliminary lists of participants of the World Draughts-64 Championship 2017 among men and women published. First participants from Uganda, Kazakhstan, Turkmenistan and Jamaica will arrive at the championship tomorrow. 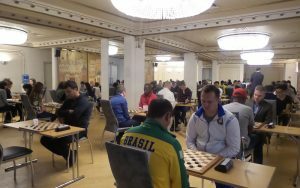 In the Press section of the website you can find the first responses in the press about the World Draughts-64 Championship in St. Petersburg. 30-09-2017 Rapid program of the World Championship will be held on the Brazilian version of draughts-64. IDF board approved a table for drawing initial moves and positions for Brazilian draughts. Table of draw will be used in the Rapid program of the World Championship 2017 for men and in the official IDF competitions for the Brazilian version of draughts-64. World Draughts-64 Championships are held since 1985. 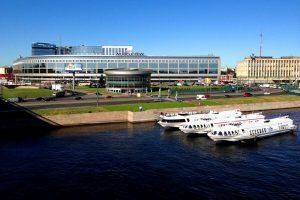 The World Championship in St. Petersburg is the jubilee – the 30th for men and the 15th for women. It should be noted that in recent years St. Petersburg has become the world center of draughts on a traditional 64-cell board. The city has long-term draughts traditions and a great experience of holding draughts competitions on the highest level, including world championships. World Draughts-64 championships 2011, 2013 and 2015 held at a high level in St. Petersburg, made a great contribution to the history of draughts sport and served as a huge impetus for the development and promotion of draughts on a traditional 64-cell board throughout the world. Draughts-64 became to a new level. 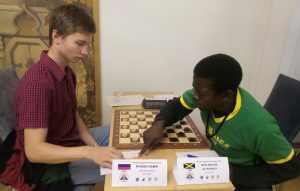 Now there are more than 70 countries of the world in the International Draughts Federation (IDF). High-level championships of Europe and Asia, major international tournaments are held regularly. In 2016, the first African championship was held in Zambia, and in 2018 the first championship of Pan America will be held in Jamaica. Strongest players of the world from forty five countries, representing 4 continents: Europe, Asia, Africa and America, has already confirmed participation in the championship. The prize fund of the championship is 3 000 000 rubles (about 52 000 US dollars).